For your consideration, is Superman a Canadian character? See also Joe Shuster, Hal Foster (and other creators that moved outside of Canada and had a career working in American comics) are they Canadian or not? No, Superman is not Canadian. This fictional character created by two teenagers living in Cleveland,Ohio 75 years ago. 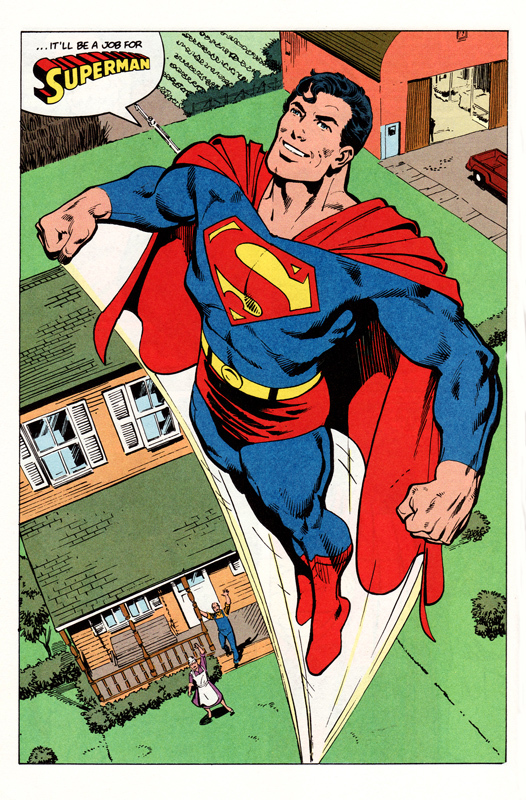 According to his official bio he came from the planet Krypton, sent before the destruction of his homeworld while still a baby – his rocketship landed outside of, and he grew up around, the fictional city of Smallville, Kansas, USA and currently resides in Metropolis (no state indicated), also in the USA of the DC Comics version of our world. It is rumoured he does maintain a Canadian address, somewhere near the North Pole, but there’s nothing on Canada411 to confirm that. In some stories he claims to be a citizen of the world, so that’s something since Canada is part of the world… but no, not Canadian. Created by two fellows living in America, sold to an American publisher. That being said, Canadians have embraced Superman, one of the world’s most recognizable pop culture icons with national pride because one half of the creative duo that created the character was born in, spent a number of his formative years in Toronto, Ontario, Canada and has strong familial and cultural ties to Canada. We like the fact that a Canadian had a hand in the creation of this iconic character. Some folks have also gone so far as to ask is Joe Shuster actually a Canadian? Our short answer is yes, he was. Canada played an important part of the Joe Shuster (and Superman) story until 1942 when the war prevented both Joe and Superman from coming back to Canada. Superman would return when the War Exchange Conservation Act ended, but unfortunately Joe would not return after the war – at first because he was too busy, but in later years because of health, financial and immigration issues. Shuster also would later say that many of the things that he saw while in that city as a child (and as a young adult) inspired Metropolis, the city that Superman eventually made his home, and the Daily Star (later Planet), the newspaper where he works. Traveling back and forth between Cleveland and Toronto as he did in the 1930’s, Toronto was definitely the more urbanized city. Jerry Siegel may have been thinking New York when writing about Metropolis, but Joe was drawing Toronto. In many ways, Superman is a paragon of virtues that Canada has always espoused. According to famed Canuck novelist Mordecai Richler (The Apprenticeship of Duddy Kravitz, Barney’s Version, Solomon Gursky was Here, Jacob Two-Two series), Shuster’s Superman is a perfect expression of the Canadian psyche. The mighty “man of steel” hides his extraordinary strength, speed, and superhuman powers under the bland, self-effacing guise of the weak and clumsy Clark Kent. He is a hero who does not take any credit for his own heroism, a glamorous figure in cape and tights who is content to live his daily life in horn-rimmed glasses and brown suits. Superman, according to Richler, with his modest alter-ego, is the archetypal Canadian personality who became a “universal hero,” famed throughout the world as the champion of everything virtuous. This year (2013), the character’s 75th anniversary saw a national campaign in Canada with stamps and coins that has become one of the biggest and most successful campaigns that Canada Post and the Royal Canadian Mint have had. He may not be Canadian, but Canadians love Superman like he was one of our own. Much in the same way that we have a strong affection and pride for actors and musicians that have success internationally. Superman by John Byrne. Unlike Superman, Byrne was Canadian – at least for a little while, before he, like Joe Shuster, went to live and work in the United States. Shuster, Byrne, Clark Kent… all immigrants with Canada in their backgrounds. Dan: Tom Grummet told me when he drew the wheat fields in Superboy, they were the wheat fields outside his window, ergo they were Canadian. And when Jeff Lemire was writing Superboy, the setting is pretty much Essex County (complete with crow). Metropolis was modeled on Toronto and the Daily Planet was a stand-in for The Toronto Star. He may not be Canadian, but there’s a lot more Canada in him than we give credit for. Like you say, Kevin, he’s a visitor in America from a far-off place who looks like an American and sounds like one — sounds pretty Canadian. And when DC wanted to reboot the character in the 1980s, they turned to John Byrne, a Canadian. Kevin: Definitely a lot about Superman that has echoes of Canada, and when done by Canadians their experiences and vision go into the mix. Joe Shuster himself being an immigrant who had great success in the United States like many of the people of his and the previous generation — they (Jerry and Joe) were themselves the sons of immigrants from far off places and to kids in Ohio Eastern Europe might as well be a foreign planet – especially given the oppression and genocidal realities they faced that led them to go to America (or in the case of Joe’s father and his brother, his mother and his aunt — Canada). You could say Superman is the ultimate immigrant success story. This entry was posted in Canadian Heroes, General News, Hall of Fame by Kevin A. Boyd. Bookmark the permalink.